Earn $2.67 in VIP credit (267 points)What's This? A high mileage tire that still offers race performance. Great choice for riders looking for a long wearing tire with excellent performance. RaceGuard puncture protection belt. With it's excellent traction, the Durano is particularly well suited to wet winter training rides. This version of the Durano is available in Black, 26 x 1.1 Inch (28-559), features a folding bead, and carries a maximum recommended pressure of 115 PSI. 260g. This size is used on modern mountain bikes and many recumbents and hybrids. Note that this tire is too narrow for many conventional mountain bike wheels. Decent price. Good availability of products on this site. I'd order from here other parts of course. Beadless tire was really difficult to install due to the snug fit. It took some intense grip strength to push the last bit of rubber over the rim. But its been a great, smooth ride, good for 26 road bike wheels. These tires are used on a Catrike and are smoother and softer than the Kojaks they replaced. These tires are awesome. Fast. Folding bead. Their customer service can't be beat. I went through many of these tires and will not order any other. Puncture protection is outstanding. Great 26" tire for your city rides or anything. . I had another Schwalbe tire but they were discontinued so this is the second time I've had these. The first set of Durano's didn't seem to last long, the side walls seem to have cracks, a lot of cracks. And the tires were not very old and always kept indoors. I don't remember my other Schwalbe's having that problem and they were on the bike for 3 to 4 years before replacing with the Durano's. We'll see how this set last. Oh my last rear tire (26) had a puncture or something on the side!! Not sure if it was from one of the cracks or I hit something? Might look into something else next time if I can find something just as light weight. I always get high mileage out of the Schwalbe Durano tires. The Schwalbe Durano tire performs well on my Bacchetta Giro. It looks sharp on the bike and this model has always given me high mileage with few flats. I race handcycles and use on rear wheels light and reliable. I race marathons in the handcycle division and always worry about flats, this tire has greatly reduced my flats and rolls great. Perfect for having the best of both worlds! I purchased the foldable tires because of the higher PSI. I bought a mid-life-crisis Mountain bike Ralley Tandam. I would like to think I ride off road a lot, but the reality is my wife and I ride on paved trails every other day. We have been using the slick centerknobby side 65psi tires for years. These are nice, but on long paved rides soak up a lot of energy that could go to the forward movement. 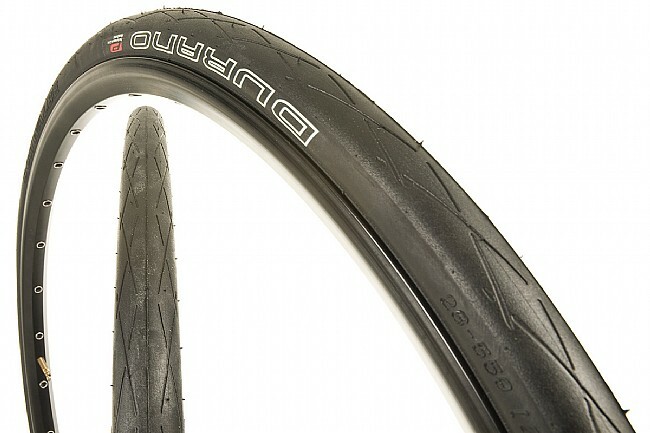 These Durano tires make the MB tandam feel like a road bike with sew-ups (Crazy right?). You can stay longer in gears, turns deeper, they react, have a smooth ride just like sew-ups, and of course there's staying in the top end of the big gears forever! They do fine in the dirt too. With a quick change of these tires, I have a mountain bike tandum and road bike tandum all in one! I use the Schwalbe Durano 26 x 1.1 tire on a Windcheetah recumbent trike. I am a very high mileage rider (25K milesyear). Tire longevity on a trike is a major problem, because the tire always run at a constant lateral angle (you cannot lean on most trikes). I have tried many different tires in the sparse narrow 26 road category, with varying degrees of performance. The Schwalbe Durano has been one of the best performers with a reasonable wear (about 5000 mi.) at a reasonable pressure (100-130psi). The RaceGuard built in belt results in the best puncture protection of the tires I have tried, which is paramount in the thorn ridden AZ environment. I will continue to use the as long as available and would not hesitate in recommending to anyone for use in similar conditions. Nice improvement over the 26x2.00 tires that came on my comfort bike. The main reason I bought these tires was to allow me to average higher speeds on road rides on my comfort bike. The bike came with 26x2 tires with a max air pressure of 65 lbs. Those tires serve their purpose well but I wanted to go faster. These 26x1.1 tires are lighter, narrower, and hold 115 PSI and have done what I bought them to do. Excellent road tire for my bent rear tire. This is my second set of Schwalbe Durano tires for my bent, excellent choice for anyone who is looking for high pressure, minimal rolling resistance and fast results. Since most of the weight in on my rear tire I ride with a tire liner in the rear and wo a tire liner in the front. I never had a problem with the front wo the tire liner. I have over 6,800 miles on my bent since Oct 2005. If interested please read my review of the 20 Durano. These Durano tires are great for my tandem! Need a lightweight yet durable tire with excellent flat protection. This tire seems to roll well and stands up to glass and debris. I have ridden some pretty nasty roads without incident. The ride is a bit rougher because of the low profile and stiff sidewalls, but nothing you wouldn't expect for this type of tire. Really helps make my old (no suspension) mountain bike ride well on the roads. I will buy another pair if these ever wear out. 40 of 43 customers found this review helpful. Bought these to replace some old Continental 26"x1" that I ran on my old school Kestrel MTB - I run Conti's on all my road bikes and love them but thought these Schwalbes might be a bit more tread for running to the gym, around town, etc. After just a few rides last weekend, I know it was the right choice. Pumped up to 100psi, these tires are fast on a MTB and make cruisin around town a blast. Plus, they were a bit cheaper not by much than new 26x1" Conti's. In addition, this is probably my fourth order from Biketiresdirect.com and they always deliver as promised....just wish my favorite tires didn't keep getting more expensive!! Thousands and thousands kms with these tires. I use an arms bike (Quikie) in Florida in the Winter and in Qubec during the Winter. best tires I never have.